Old Rectory Barn Self Catering01873 830244work Self-cateringOld Rectory Barn is beautifully renovated, situated within the Brecon Beacons National Park, close to the hills, rivers and castles of Monmouthshire yet also convenient for the Industrial Heritage sites of the South Wales Valleys. It is within walking distance of the Brecon and Monmouthshire canal. The Barn is ideal for families or large groups as the 2 cottages can also be booked together (sleep 10). When we undertook the renovation we retained original features e.g. oak beams & stonework, yet have still created a modern & sustainable environment. The Barn has been a finalist in 2008 & 2009 National Environmental Awards and awarded the Green Business Tourism GOLD Award. STABLES sleeps 4 people in 1 twin and 1 double bedroom, both en-suite. It has its own kitchen/living room. It is all on the ground floor with french windows to the garden from the living room and a patio area with seating and a BBQ. LOFT which is set over 2 floors sleeps 4-6 people in 1 twin bedroom and 1 family room, both ensuite. The twin room has a wet room whilst the family bathroom includes a bath with shower over. Loft has its own kitchen/living room on the first floor with views to the Sugar Loaf. There is a cloakroom in the hall. The patio and garden have seating and a BBQ. Prices are all inclusive of heating and electricity and linen and towels. We provide a Welcome Pack of local produce. Both apartments have Freeview Digi TV and WiFi, and share a utility room with washing machine and dryer and separate freezer. There is also a drying room for wet weather gear and secure storage for cycles etc. You can abandon the car and spend your days walking or cycling and absorbing the fascinating local history but the whole of South Wales is easily accessible from here, including Cardiff if you feel like a day out in the capital city of Wales. Old Rectory Barn is beautifully renovated, situated within the Brecon Beacons National Park, close to the hills, rivers and castles of Monmouthshire yet also convenient for the Industrial Heritage sites of the South Wales Valleys. 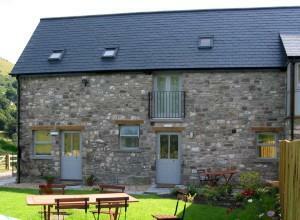 It is within walking distance of the Brecon and Monmouthshire canal. Short breaks available subject to availability. Stable £230. Loft £250. As you leave Gilwern village on the Crickhowell Road (A4077) turn left opposite the Corn Exchange Pub. Turn left again into Maesygwartha Road immediately after crossing the Brecon and Monmouthshire canal. Turn sharp right at a small crossroads as you leave the village of Maesygwartha and after100m right again into our drive. The Barn is signposted from Maesygwartha Road. By train to Abergavenny Station, taxi or bus from station or pick up can be arranged. Access Statement for Old Rectory Barn The accommodation for Stables is all on the ground floor with easy access to outside seating areas. One double bedroom and 1 twin bedroom plus open plan kitchen/living room. Loft is spread over 2 levels with a stairway. One twin bedroom on the ground floor and 1 double/family bedroom and open plan kitchen/living room upstairs. Corridors and doors are all 800mm or wider. Well lit throughout with both central and supplementary/task lighting. Although we have tried to be as accurate as possible and include as much detail as possible in this statement, we are always willing to give information on any aspect if this statement does not answer your particular question. Approach to the Property: A sharp turn right from Maesygwartha Road into single vehicle width tarmac lane (signposted). After 100 metres a right turn (signposted) into a flat single vehicle gravel driveway approximately 300 metres long. Opens up into wider gravel access and turning area in front of barn. Security lighting once near to property. Parking: For up to 6 cars. Flat with part on gravel and part on paved area (allocated as disabled parking) that has a paved pathway (5 metres) leading to accommodation. Security lighting. We are happy to help with unloading luggage. Paths and Gardens: Area directly around barn all paved, leading to all doorways and garden. Front entrance is a double door with a step threshold and all other external doors (800mm or wider) have step thresholds but a portable threshold ramp is available. All external doors have hooks to hold open and except for the front entrance are spring closing. Stable patio areas have a paved ramp access. Security lighting covers all areas. Tenant controlled external lights for all seating areas. Emergency lighting at all external doors. Bathrooms: Stables: Stable 1 – ensuite bathroom for twin bedded room. Flat access but step into shower.Toilet height 43mm– has a handrail for right hand transfer. Hand mirror available atlo wer height. Lever taps. Stable 2 - ensuite bathroom for double bedded room. Small floor area, flat access but step into shower. Corner toilet (43mm height) no handrails. Lever taps.<br> Loft: Byre - ensuite wet toom for twin bedded room. Flat access shower. Toilet height 43mm - has a handrail for righthand transfer. Hand mirro available at lower height. Lever taps Loft - en-suite bathroom for family room. Step in bath with 2 integrated handles and shower over. Toilet height 43mm. Level taps. Internal Doors: All wide openings (800mm or wider) with lever handles but those that are fire doors have spring closing. Switches and sockets: Every room has a mixture of heights of switches and sockets. Each bedroom has some at unit height. Bedside lamps and other lamps all have integrated switches. Switches for kitchen appliances above worktop height - 1200mm. Cordless kettles. Alarms: Auditory fire alarm system linked to emergency lighting for power loss with illuminated fire exit signs at doors and a push bar emergency exit (width 950mm) on ground level leading to sloping paved pathway. Transport: Nearest train station is at Abergavenny (15 minutes drive). Local taxi service available but no convenient bus service. Abergavenny has a Shop Mobility Service. We can put you in touch with a local wheelchair hire service. Dogs: Dogs are welcome but only service/assistance dogs are allowed in the bedrooms. No dogs should be left alone in the property. Stairway: Stables is all on the ground floor. Loft has stairs to second bedroom and kitchen/living room. Well lit with emergency lighting. Hand rail on left for turn at bottom and on right hand side for main staircase. Communications: Excellent mobile phone reception. Internet access. Owners live inadjacent property and are available to assist if required. Telephone numbers for local taxi service, doctor and vet provided. Other information *	Non feather pillows and duvets *	A shower chair is available on request *	Remote control TV with DVD *	Dropdown oven doors *	Outside access to utility area via sloping pathway with step up into room and narrow corridor space.